Reeder is my favorite RSS reader for iPhone and iPad. I might even say that Reeder is one of my favorite iPad apps, together with Twitter, Flipboard and Simplenote. When developer Silvio Rizzi told me I could get into the Reeder for Mac testing team I immediately jumped in. Reeder for Mac will be awesome. I have no doubts about that, but we can't share all the details now. The app is still in its early development stages, many things will probably change by the release date and most of all: don't ask for a release date now. 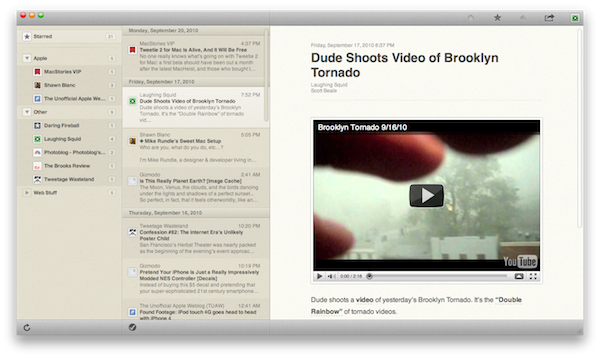 I don't know when Reeder for Mac is going to be available. Nor do we have "invites" for the beta or are in the position to hook you up with a beta copy. 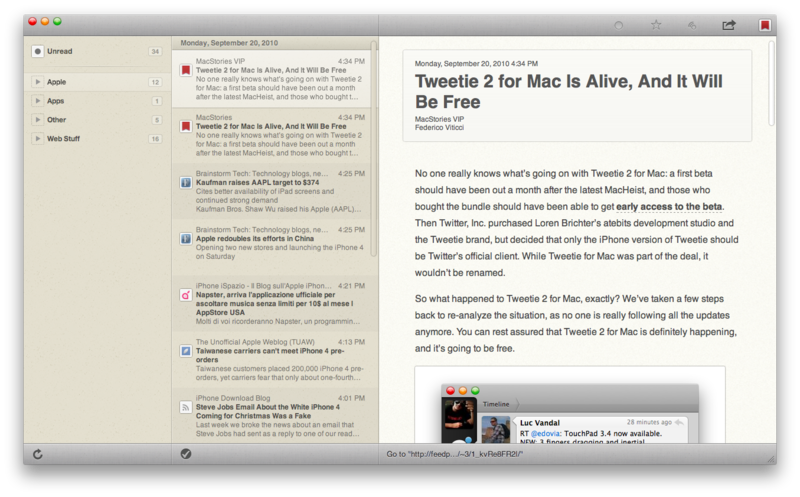 We had permissions to post a couple of screenshots form the latest build of Reeder for Mac. It's going to be the ultimate RSS app on OS X. For those of you already familiar with Reeder, the Mac version will make you comfortable with its navigation methods and UI approaches. The UI is already highly custom, and definitely resembles the one from the mobile counterparts. Nice graphics aside, Reeder for Mac will change the way you consume RSS on your Mac desktop: I used to be highly dependent on the web Google Reader interface, but since I tried Reeder for Mac I made the switch. Crazy fast engine. Keyboard shortcuts. Beautiful animations. Great features. I can't wait to share more with you guys. Take a look at the screenshots below, and make sure to click on the images for full size. We will keep you posted about Reeder for Mac development. P.S. Don't look at those traffic lights. I'm using a custom theme on my MacBook.